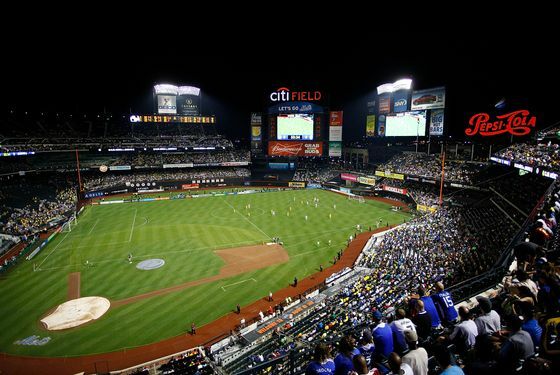 Citi Field has the good fortune of having a few days off from the Mets — who have lost eleven of their last thirteen games there — and is spending its time preparing for soccer. The Mets' official site has some nice pictures of lawn-care folks preparing the field for tomorrow night's friendly between Chile and Ecuador, the third soccer event at the stadium. Tomorrow night is an international night for friendlies as everyone prepares for more World Cup qualifying — the U.S. is actually playing Mexico, which we'll be talking about tomorrow — and Chile is heavily favored. In case you were wondering, the cheapest ticket on StubHub for tomorrow night's game is 52 bucks. The cheapest ticket for the Mets' next home game, August 20 against last-place, Colorado, is $9.90. So, at last, this contest will determine which nation is the greatest on earth: Chile! Or Ecuador!